Are you hungry to achieve excellence? Are you seeking the tools to realize the highest version of “you”? Do you seek a career path which promotes upward mobility? If so, apply for our Line Cook position today! White Dog Cafe, an iconic restaurant in University City for over 30 years, is a leader in using environmentally sustainable, organic and local foods from farms within 50 miles. Known for warm hospitality, inspiring and award winning food, the White Dog's historic three brownstones were recently completely renovated offering charming and whimsical dog décor and artwork in its many unique dining spaces and outdoor patio. The seasonal menu changes often, with innovative dishes highlighting local ingredients such as the Homemade Rigatoni with Spicy Lamb Bolognese and Basil Ricotta, Lancaster County Chicken and Verlasso Salmon as well as Market Salads and delicious shared Small Plates. Complimented with an all American wine list, local craft beers and seasonal specialty cocktails and refreshing mocktails. 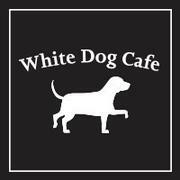 White Dog Cafe is open for Lunch, Brunch on Saturday and Sunday and nightly dinner.